Marion's mixer design is simple. Nearly 70 years of design enhancements and improvements for "real life" mixing requirements have made the design clean, simple and highly effective. 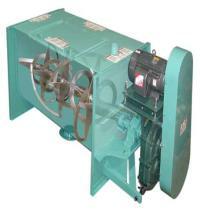 Batch and continuous paddle and ribbon mixers for the processing industries. Click on Mixer to view animation. Phone line connection speeds will take longer to download. Marion Mixers, Inc. (originally founded as Rapids Machinery Company in 1933) has been a leader in the design and manufacture of custom, industrial mixers and blenders since 1938. Nearly 65 years ago, Marion developed a specially curved, adjustable paddle blade that provided a unique "figure 8" mixing action. The paddle mixer's rugged design and ability to blend both dry and wet materials proved ideal for feed applications. During the 40's and 50's, feed mills and farmers' cooperatives across the country made the brand name "Marion" a standard within the industry. A "Marion" paddle mixer featured rugged, cast iron arms and hardened adjustable paddle blades. Even with the adverse environmental conditions of feed mills, many of the Marion's batch mixers built in the early 1940's are still in operation today. In later years, Marion's paddle mixer design was adapted to meet the increasingly sophisticated requirements of industries such as chemicals, foods, minerals and plastics. Stainless steel batch mixer models were added for sanitary or hazardous applications. Welded arm designs were added for easy clean out. Continuous mixers were developed for use on process lines. Mixers with high-speed choppers, heating and cooling jackets and vacuum capabilities were designed. As Marion's popularity grew within a number of different industries, so did our line of products. Marion builds a double-flight ribbon agitator with 2 inner and 2 outer ribbons for twice the mixing action as single-flight designs. Treat the customer with respect, fairness and prompt service at all times. Constantly search for ways of making products and service better. Never compromise quality for quantity. Marions are designed and produced in our world headquarters located in Marion, Iowa, USA. Each machine is individually designed, fabricated and inspected to ensure the needs of the customer are met. Based on a database of thousands of proven applications, new mixers are designed for volume, horsepower and production through-put. Various alloys of stainless, carbon and abrasion resistant steel are used to match material properties with application needs. Documented quality control procedures ensure each mixer meets our exacting standards. Marion maintains a fleet of trial mixers which are offered to potential customers free of charge. The data obtained from preliminary tests is used in the design of the production sized mixers. Marion maintains an active parts history on every mixer manufactured to ensure continuity of the mixer's design. Application and design engineers are on staff as a reference source for mixing or blending questions. Marion maintains stock of parts for most Marion Mixers built in the past 60 years. Shipment can usually be made the next day. Marion Mixers is represented across the continental United States by qualified, independent representatives. These local contacts are available for immediate, on site assistance. Export sales are managed by our factory sales staff. Marions are designed for decades of consistent, trouble-free production. Our craftsmen build only the best: solid core agitator shaft, machined castings for seal housings, hand polished finish for sanitary units, .020" blade clearance with trough, plasma cut bearing plates and laser cut safety grates. The production team at Marion uses state-of-the-art welding and fabrication equipment. These extra efforts can be seen in the appearance and performance of our mixers. Marion stands behind every mixer built. We warrant our workmanship and materials for 12 months after installation and 15 months after the sale.